Sometimes, you flash a new ROM and come to find out, it doesn’t have Google Apps coupled with it and ROM Manager was also left out. So, what’s a flasher to do? Thankfully, Koush has fixed this from being an issue down the road. 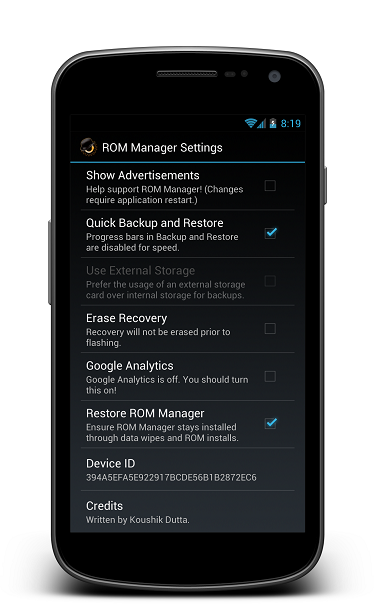 With the new “Restore ROM Manager” feature, ClockworldMod Recovery checks before reboot whether ROM Manager is installed on your device under system/apps. As long as you have that settings box checked, whether you wipe all of your data or not, ROM Manager will be there to greet you upon reboot. Definitely a saving feature for the habitual ROM flasher.